They call it the Amateur Radio Service. As a group, ham operators embrace the word "service". Practically all of us have our hand-held radio and our " Go boxes" strategically placed, awaiting that one big disaster, in which we will spring into action and serve our fellow man. There are also those within in the amateur radio community for which "service" is a way of life. One such person was Janet Welsh-NK7N. Janet and her late husband Lee-KI7EY lived for some time in Henderson, Nevada and were involved in virtually every aspect of amateur radio in Southern Nevada. At a time when women operators were scarce and few rose above an entry license, Janet Welsh tutored herself and obtained one of only three Extra Class licenses held by women in the state of Nevada. Janet and Lee taught licensing classes and Janet served as the Coordinator of the local VE team. Hundreds of hams can look back at their CSCE and know that Jan Welsh and husband Lee were there the day they became a licensed operator. Jan and Lee were members of virtually every ham radio organization in Southern Nevada. Janet was active in the Red Cross and with ARES/RACES serving as an EC. She saw real time ARES action at the PepCon Chemical Plant explosion in Henderson and in the Moapa Valley floods. Janet also served as Assistant Nevada Section Manager and in March of 2001 she was appointed as Nevada Section Manager following the death of Bob Davis-K7IY. In 2004, Lee, who was Jan's husband of fifty years passed away. Janet then relocated to the Dallas-Ft. Worth area. Janet Welsh-NK7N became a Silent Key in Dallas, TX on July 22, 2013, while holding the hand of her grandson Michael. Janet is survived by her daughter Carol Welsh-KD7GRF of McKinney, Texas and son Kenneth of Puyallup, WA, four grandchildren and six great-grandchildren. It was just two short weeks ago that I visited with the ever pleasant Wilse Morgan WX7P. I have learned that Wilse has since became a Silent Key, having succumbed to cancer on June 13. I have known Wilse for a dozen or more years. We really got acquainted at a long ago SeaPac DX Luncheon. We were seated side-by-side and the speaker was a "no-show", which left the two of us with plenty of time to swap tales. It was very easy for me to like Wilse. It was also plain for me to see that Wilse was a man who got a lot out of ham radio and it was even more evident that Wilse "gave as good as he got". WX7P had an amateur radio career that spanned more than seven decades! First licensed back in 1952 as WN6PVF, it would be under the call KL7CQ that Wilse Morgan would go down in the history books and shape the future of amateur radio in the United States. Working on behalf of the Anchorage Amateur Radio Club, Wilse petitioned the FCC to become the first Volunteer Examiner in the United States and submitted a proposal outlining the VEC program. Wilse was the only Volunteer Examiner ever to be certified directly by the FCC (all others have been certified by their repective VEC's). In 1984 Wilse, along with Roger Hansen-KL7HFQ, and Margaret Ogren-KL7KL administered the country's very first amateur radio examination by a VEC. several years by the FAA. Owned and operated a successful printed circuit board company with nearly 100 employees. Went to work in Alaska on the DEW Line and Early Warning radar systems. Taught amateur radio for 13 years at the Community College in Anchorage. 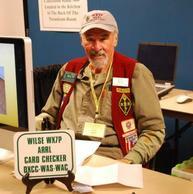 Wilse was on the DXCC Honor Roll with 280 confirmed and he helped others acheive this goal by volunteering as a card checker. In fact he was busy performing that task two weeks ago at SeaPac. He also spent considerable time manning the ARRL booth at the convention and it was here that Wilse and I shook hands for the last time. SeaPac weekend was busy for Wilse in addition to manning two booths, he also topped it all off by filling the room when he gave his seminar on building a 1000 ft Beverage antenna. If all of this wasn't enough Wilse was serving as Assistant Section Manager for Eastern Washington at the time of his passing. I've heard it said that men sometimes wear the hearts on their sleeves. With Wilse I believe he wore it on his back. I do not recall ever seeing Wilse when he was not wearing his bright red vest, emblazoned with amateur radio patches, badges, and pins. Speaking of awards, Wilse had many, including being inducted into the CQ Magazine Amateur Radio Hall of Fame in 2009 and one from the ARRL for helping save 9 lives from an airplane which had crashed into remote Lake Minchumina in Alaska. Two days before becoming a Silent Key Wilse received a plaque for high score in the NW Division for Unlimited Multioperator in the 2012 ARRL June VHF contest, breaking his own record with a score of 101,010 points from 532 QSOs. If you been a visitor to the AES store in Las Vegas in recent years, then you were sure to have made the acquaintence of Bill Foster. W6EIO was part of the team of countermen who daily greets hams from all corners of the globe at Amateur Electronic Supply. Bills wide-grinned smile helped to give AES its comfortable atmosphere. Bill passed away suddenly, Wednesday morning May 22nd. Bill and his wife Sue were in the process of purchasing a new home and relocating to California. Bills last days were filled with amateur radio. 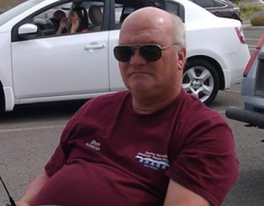 He returned to Las Vegas on Tuesday after a very enjoyable time at Hamvention in Dayton, Ohio. On Wednesday morning Bill was feeling so poorly, that he elected to go to the emergency room. Sadly, Bill did not survive the trip. William Foster-W6EIO was a man of faith who deeply loved God, Family, and Country. A celebration of life service was held Monday May 27th.